By admin , in Sciatica on December 31, 2018 . 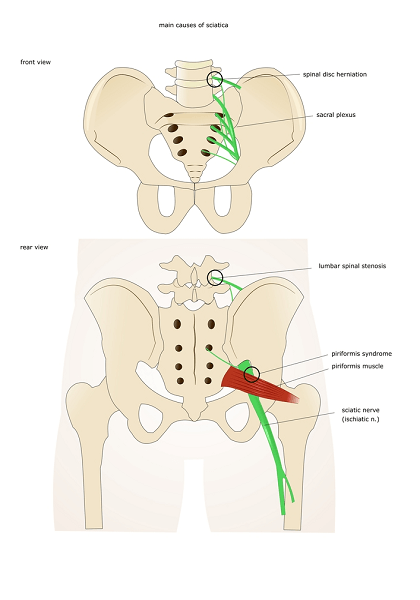 Sciatica nerve pain can involve a shooting pain, tingling and a numb feeling in the lower back area, the leg, and sometimes right down to the foot. The compression of the sciatica nerve roots in the lower back is what causes this form of pain and discomfort, which can often be extreme and result in a person being unable to undertake even basic daily tasks like bending over, sitting and walking. Some people can experience sciatica related back pain constantly, whilst others will notice it more after sitting for extended periods of time. For some people, the pain is experienced even when laying in bed, resulting in poor sleep and additional health problems as a result. 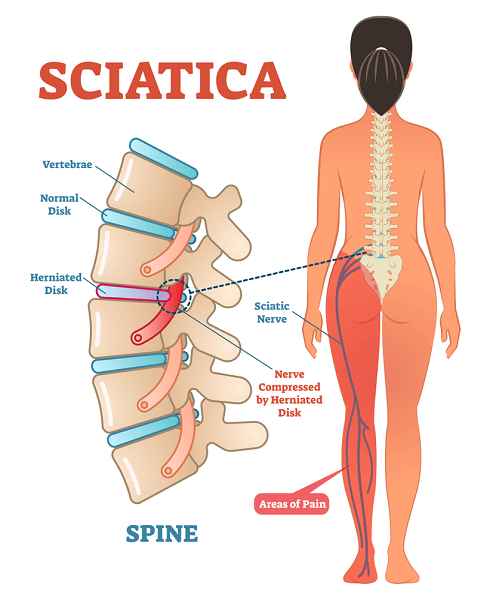 1 WHAT CAUSES SCIATICA PAIN? 1.1 HOW CAN MASSAGE HELP WITH YOUR SCIATICA PAIN? 1.1.1 WHAT IS THE BEST WAY TO GET A MASSAGE FOR YOUR SCIATICA PAIN? 1.1.1.1 IS MASSAGE THE BEST TREATMENT FOR SCIATICA BACK PAIN? The reason for sciatica related back pain can include a pinch of the nerve itself, a slipped disc, degenerative disc disease, joint conditions, and even just poor posture. In reality there are a wide range of reasons that sciatica pain may start to occur either suddenly, or coming on gradually over time. It is important to be aware that sciatica is considered to be a symptom rather than a cause of back irritation. It is not always possible to pinpoint an exact cause of the onset of sciatica pain, but your doctor will likely order a number of diagnostic tests to attempt to determine exactly why you are experiencing lower back and leg pain. Some people who believe they are suffering from sciatica pain may in fact be experiencing a muscular related condition that brings about similar symptoms. This is why receiving a proper diagnosis is so vital before embarking on treatment and pain relief. Once you have confirmed that you are indeed experiencing sciatica pain, then it’s time to think about what course of action you’re going to take to relieve it, so you can start doing those everyday tasks again without the agonizing pain. Massage therapy is one of several natural treatments that people use in an attempt to relieve back pain that is caused by the sciatica nerve. Importantly however, massage therapy for lower back pain must be undertaken by a trained professional in order to avoid further pain and injury. HOW CAN MASSAGE HELP WITH YOUR SCIATICA PAIN? A lower back massage conducted by someone who is familiar with the spine and the sciatic nerve can help to relax the muscles in your back. This loosening up of the muscles which are impacted by the sciatic nerve can have a very relieving effect, and this is what a good lower back massage aims to accomplish – by reducing tension and potentially decreasing the painful nerve inflammation that is causing your back, buttock and leg discomfort. WHAT IS THE BEST WAY TO GET A MASSAGE FOR YOUR SCIATICA PAIN? Although very light and gentle massages can be done at home, for the safest and best results and the greatest benefit it is always advisable to seek treatment from a health professional who has an expertise in spinal health. Chiropractors are experts in the field of spinal health and can certainly use massage as one of several possible options to both relieve and ultimately eliminate your lower back and leg pain. What might your chiropractor or other back health professional do to relieve your sciatica back pain? Generally a combination of methods will be used, depending upon the level of your pain and what the exact diagnosis of your back condition might be. This can include massage, stretching, adjustments, and more advanced methods such as cryotherapy (using cold temperatures to treat the painful area) in some cases. Your experienced health professional will know the best form of therapy to follow in regards to your specific condition. The goal of the massage portion of a complete treatment plan is to assist in relaxing the muscles around the spine, which have often become tightened, while if you progress to a cryotherapy treatment on advice from your doctor the goal is then to reduce any inflammation that may be present around the sciatic nerve. IS MASSAGE THE BEST TREATMENT FOR SCIATICA BACK PAIN? Massage is just one of several options that are available and recommended for natural sciatica and lower back pain relief. It can be used as a standalone treatment option, or in conjunction with a more comprehensive overall treatment plan. Other natural methods that people may choose to attempt as a sciatica relief option include yoga, acupuncture, regular stretching, back support aids, and hydrotherapy – just to name a few of the possibilities. It is important to note that sciatica pain can be caused for a range of reasons, and sometimes can indicate a potentially serious underlying issue. For this reason it is wise to have your back examined by a health professional in order to determine exactly what is causing your pain. Once a diagnosis is made, you will be able to get on the path to the best treatment and recovery plan for your own personal circumstances.